August means summer is coming to an end and school starts back up soon. It also means there’s a ton of opportunities to engage the government. I wanted to share some upcoming events and information in the hopes of seeing you out in the community. As always, let us know how things are going in your neighborhood and how we might be able to assist. Chancellor Search. The Our Schools DC Leadership Committee has announced their public engagement schedule, which will include community forums, a District-wide web survey, a social network town hall, and stakeholder meetings with students, parents, teachers, and school administrators. Specifically, in August and September, the committee will host three public community engagement forums. 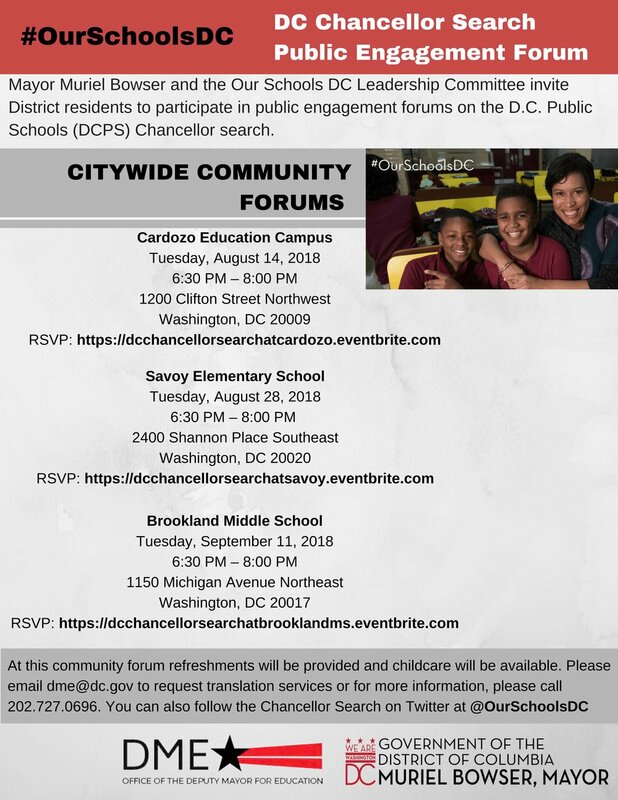 These forums will be an opportunity to provide an overview of DCPS progress, emphasize areas of focus for the next chancellor, and hear from residents about their priorities for DCPS. The closest one for Ward 2 is on Tuesday, August 14, 6:30–8 pm, at Cardozo Education Campus, 1200 Clifton Street NW. Register to attend that event, or see the flyer for the dates and locations of the other two forums. Refreshments and child care will be provided at all three events. Additional engagement events will include a virtual town hall via Facebook Live and specific stakeholder listening sessions with DCPS students, parents, teachers, and administrators. For the latest information on those events and other details regarding the Our Schools Leadership Committee and DCPS chancellor search visit: https://ourschools.dc.gov/. Kids Ride Free. Mayor Bowser’s Kids Ride Free program is getting smarter! Beginning October 1, 2018, students will no longer be able to use their DC One Cards to access public transportation. Students who use Metrorail, Metrobus, or the DC Circulator to get to and from school and school-related activities will need to obtain a new Kids Ride Free SmarTrip card. Over the coming weeks, card distribution events are being held to allow students who currently use bus and rail to get to school and school-related activities an opportunity to register and obtain their new Kids Ride Free SmarTrip card before the new school year begins. In order to receive a new Kids Ride Free SmarTrip card, students will need to be present and bring their current DC One Card or a government-issued ID to one of these events. Private and home-schooled students must bring a proof of identity, proof of DC residency, and proof of school enrollment with them. Register for the Ward 2 event on Saturday, August 18, 9 am–4 pm, at Walter E. Washington Convention Center, 801 Mount Vernon Place NW. If students are unable to attend a summer distribution event, they can get their new Kids Ride Free SmarTrip card from their school’s DC One Card administrator at the start of the 2018-2019 school year. For eligibility, registration requirements, and to sign up for one of the early distribution events, please visit www.kidsridefree.dc.gov.